Outdoor living areas. Modern trends have helped to make outdoor living areas in Loveland a top choice for many homeowners. 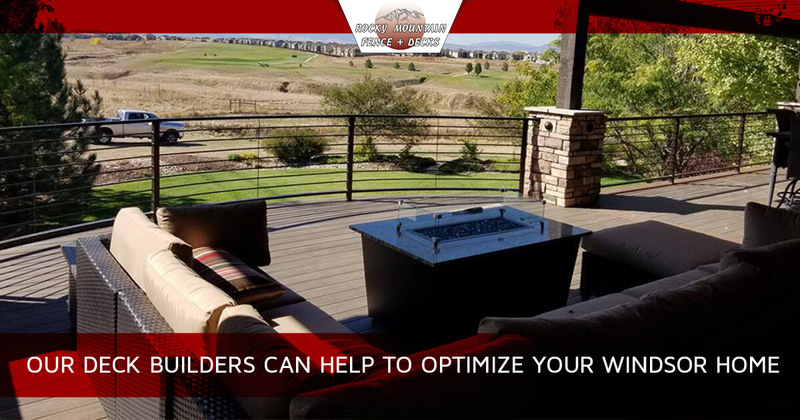 This project goes beyond a standard patio or deck installation, including a range of amenities to help you and your family spend more time in the Colorado outdoors. From cooking meals to hosting large dinners, your outdoor living area can be designed to perfectly match your lifestyle. Our deck experts can help you every step of the way, from quality deck design to the grand unveiling! Fencing. We are also Larimer County’s go-to fence company! Rocky Mountain Fence & Decks built a strong business on quality fence services, delivering a versatile approach that creates beautiful, versatile fences to keep your property safe and secure. Custom decks. Whether you’re looking for a cookie cutter deck for your Windsor home or a custom product that perfectly matches your lifestyle and budget, our team is here and ready to help. We’ll work with you to create a fully customizable planning, giving you the power to create your dream structure. Railing. Nobody will be able to enjoy your new deck if it isn’t safe! Our decking company offers Windsor residents a plethora of design and material choices for their deck railings, utilizing custom fabrication processes to better serve our customer base. From vinyl railing to composite, cable, and more, you’re sure to find the perfect system to match your home. Pergolas. If you are looking for a cost-effective method of delivering shade and comfort to your yard, a gazebo or pergola may be the perfect choice. Our pergola builders are here to help in this endeavor, offering attached and freestanding pergola designs to make your outdoor space much more enjoyable year-round. Specialty services. Rocky Mountain Fence & Decks is here to provide a comprehensive approach to your exterior home improvements, delivering a wide range of specialty skills to further enhance the outcome of your project. Hiring quality deck builders for your Windsor home will result in an optimal outcome that provides years of quality enjoyment. Our focus on getting the job done correctly and efficiently helps to make us your Top Rated Local® deck company. The Rocky Mountain team aims to provide top-notch results with every job regardless of its size. For more than 25 years, we have served the Windsor area with impressive decks, pergolas, outdoor living spaces, and more. If you’re looking for a new fence or deck for your home, be sure to contact us today! Fields marked with an * are required. Do not fill this form out if you’re a solicitor.